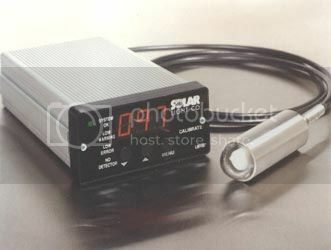 Solar Light offers radiometers covering a wide range of applications. Find the meter best for your application or contact us directly for further details. All radiometers are calibrated according to NIST Standards. 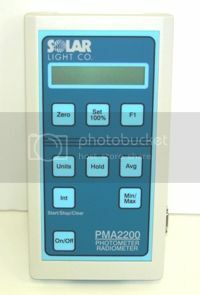 PMA2100 is a research grade radiometer, light meter, photometer and UV meter with on board data logging. The PMA2100 can be used with a selection of over 35 detectors to measure UVA, UVB, UVC, Visible, Infrared, Full Spectrum, UV Safety, Eryethema, Temperature, and Custom wavelengths. The PMA2100 can data log up to 1024 readings with a time and date stamp. This data can then be downloaded onto a PC and exported into an excel spread sheet or used to create graphs, and charts. PMA2200 is a radiometer, light meter, photometer and UV meter that can be used with any one of our detectors measuring UVA, UVB, UVC, Visible, Infrared, Full Spectrum, UV Safety, Eryethema, Temperature, and Custom wavelengths. The PMA2200 has a single input and provides an instantaneous reading. It has a sampling rate of 3 per second and a large resolution. 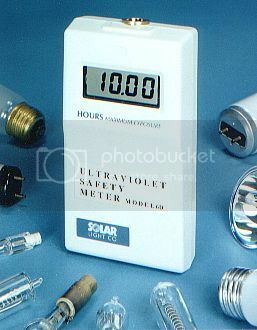 3D is a small hand-held UV meter used specifically for measuring UVA and UVB. The 3D provides a UVA reading in Milliwatts per square centimeter and a UVB measurement in MED's per hour. 6D is a UV safety meter that measures the ultraviolet light in an area and provides a value of how long it is safe for a person to be exposed to that level of UV. 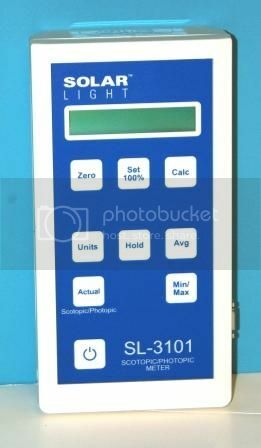 SL3101 - Scotopic / Photopic Light Meter / Photometer, is a portable and innovative meter based on the latest research involving scotopic lighting. The SL-3101 accurately measures the scotopic and photopic action spectrums to providing values of S/P ratio, visually effective light, and Perceived brightness. 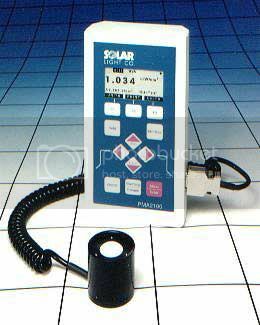 SL3201 - Sun Tanning Bed Meter is a hand held UV meter that measures the ultraviolet light being outputted by tanning beds. This SL3201 provides a reading that ensures the sun tanning bed is not output UVC or dangerous levels of UVB. SL3301 - Photostability Package, includes a handheld UV meter/Photometer to measure, record and log the UV and Visible radiation during ICH Q1B Photostability Tests following options 1 or 2. The SL-3301 provides real time radiation measurements using NIST calibrated equipment to accurately report the actual radiation exposure during testing. MICROTOPS II™ Ozonometer - hand-held ozone meter, the smallest and easiest to use instrument capable of accurately measuring the total ozone column and precipitable water. 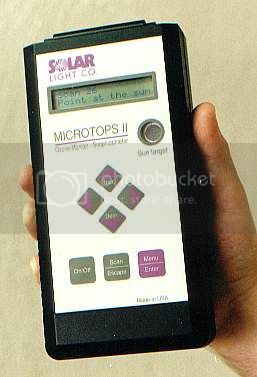 MICROTOPS II™ Sunphotometer - hand-held sun photometer, the smallest and easiest to use 5-channel instrument capable of accurately measuring aerosol optical thickness. 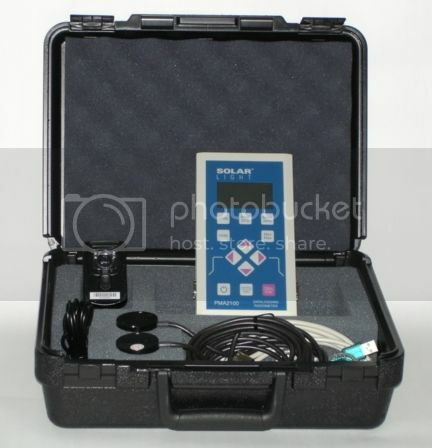 UV-Biometer Model 501 - UVB radiometer for outdoor or underwater use; interfaces with the UV-Biometer Recorder Model 501, a dedicated controller/data acquisition system; easy to install (plug-and-play) and maintain. 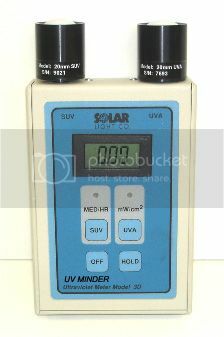 UV-Biometer Model 501A- stand alone UVB radiometer for outdoor or underwater use; connects directly to most data loggers; recommended for stations with multiple sensors and common data collection system. 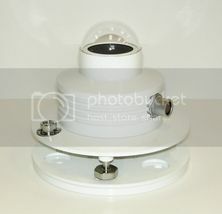 UV-A Radiometer Model 501-UVA - UVA radiometer for outdoor or underwater use; interfaces with the UVBiometer Recorder Model 501, a dedicated controller/data acquisition system; easy to install (plug-and-play) and maintain. LM100 Lamp Monitor - Industrial lamp monitor for continuous monitoring of lamps. 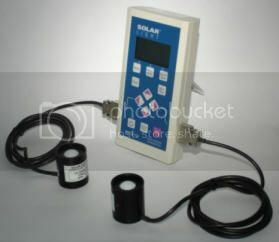 GLM100 is a complete germicidal monitoring system with detector and monitor. The GLM100 germicidal lamp monitor is designed to monitor banks of underwater germicidal lamps used in water treatment facilities.